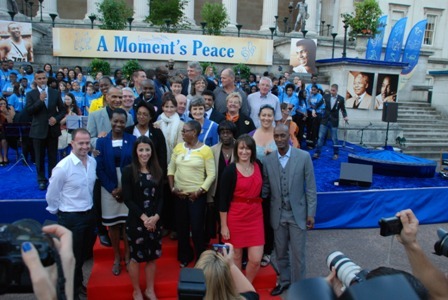 A Moment’s Peace is an inspirational project linking the peace dreamers of today with those of future generations. 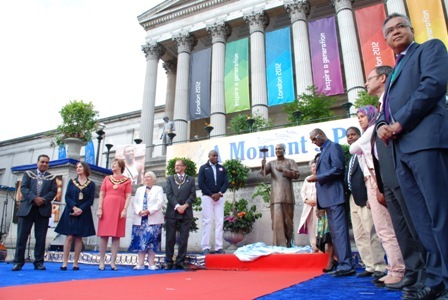 At a ceremony on Saturday 28 July, the “World Peace Dreamer Statue” was unveiled as part of the ‘Art of Olympians’ – a cultural and artistic contribution to the 2012 London Olympics. 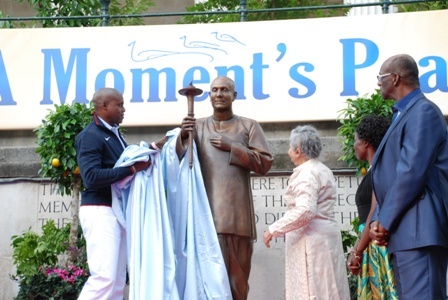 The World Peace Dreamer Statue depicts the founder of the World Harmony Run, Sri Chinmoy, holding aloft the Peace Torch that runners have been carrying for the past 25 years on a mission of peace and harmony. 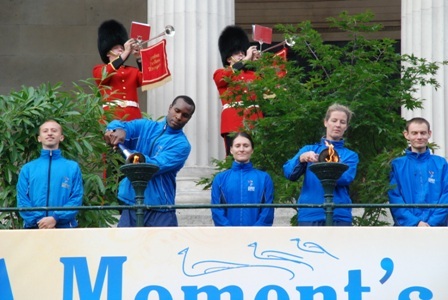 World Harmony Runners light the peace flames. 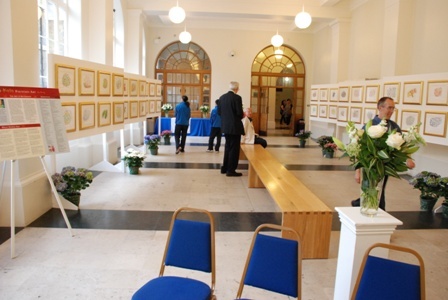 Some of the many guests in attendance. 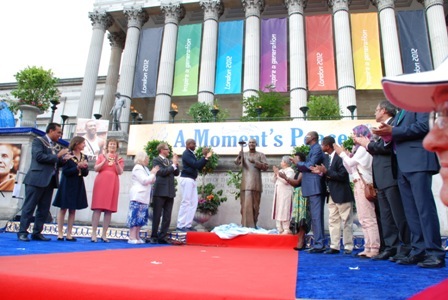 To inaugurate this project, many special guests came to offer their good will and aspirations for creating a peaceful world. 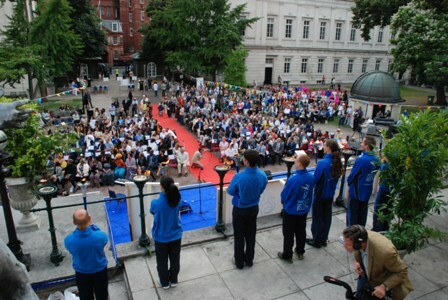 Present at the ceremony were several mayors of London Boroughs and many former Olympians who came to take part in this unique event. 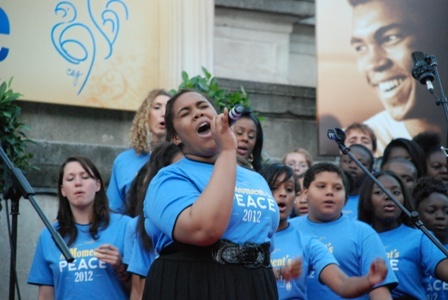 The theme of this project was passing on the baton of peace from generation to generation. 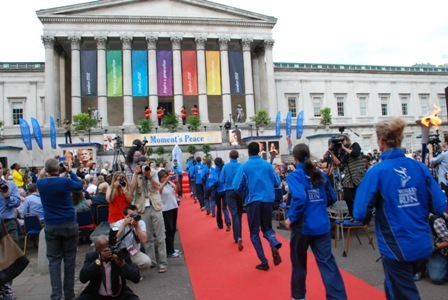 The ceremony honoured the lives of great peace dreamers of our time, including Archbishop Desmond Tutu, Nelson Mandela, Dr Martin Luther King Jr, Jesse Owens, Muhammad Ali, and Sri Chinmoy. Reverend Mpho A Tutu – Founder and Executive Director of the Tutu Institute for Prayer & Pilgrimage and daughter of Archbishop Desmond Tutu. 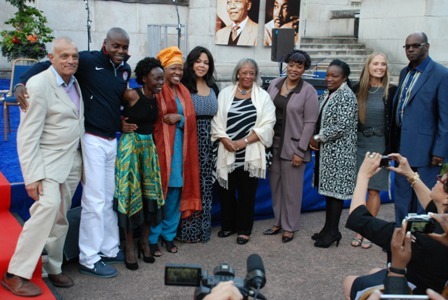 Sibongile Mkhabela – CEO 0f the Nelson Mandela Children’s Fund. 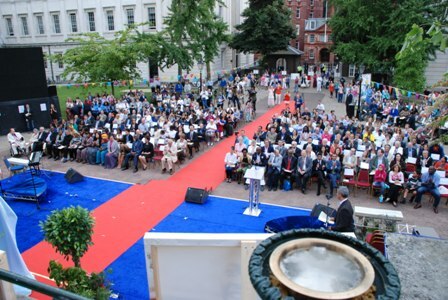 All the speakers offered heart felt words on their common aspiration for creating a better and more peaceful world. 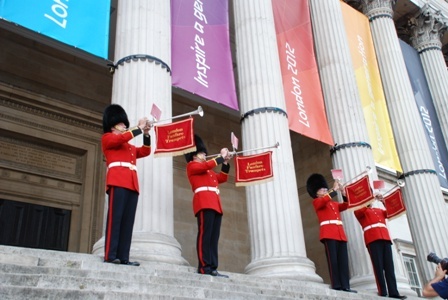 The statue was offered to the City of London from three former Olympians – Carl Lewis, Tegla Loroupe and Tatyana Lebedeva. Dr Davidson Hepburn, President of the General Conference of UNESCO, and Eric Petersen, public speaker and author of Light and Liberty. 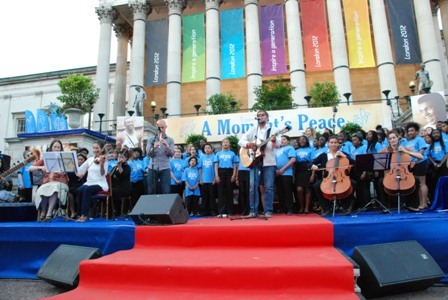 As well as speeches, the ceremony also included musical performances by the London Youth Gospel Choir, The City Academy, Hackney and Boris Purushottama Grebenshikov. 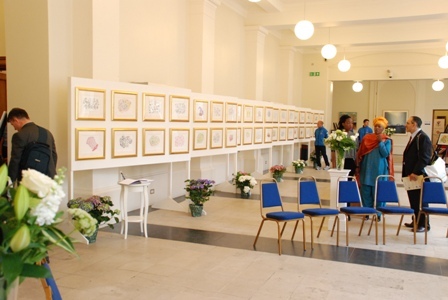 The ceremony also marked the opening of a Jharna Kala Art Exhibition – a display of Sri Chinmoy’s art at University College London.